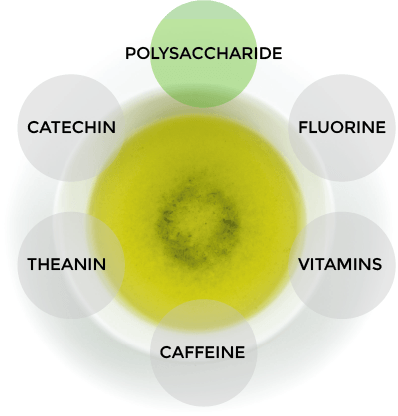 Recent studies reveal that polysaccharide lowers blood sugar level. Bancha includes it abundantly. 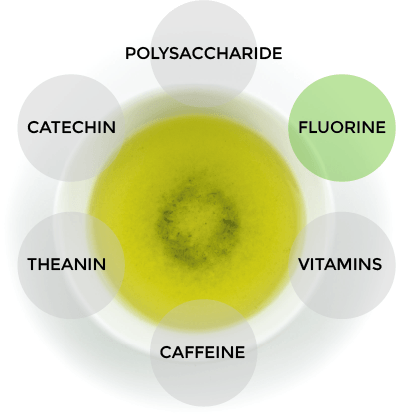 Since green tea includes fluorine abundantly, drinking green tea after meals prevents tooth decay. 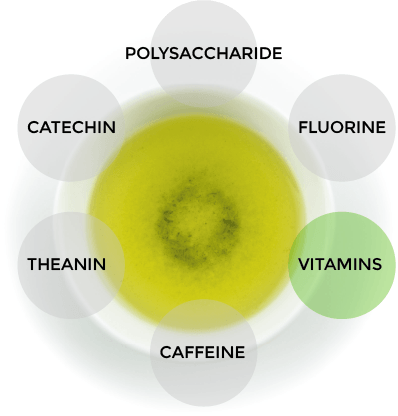 Green tea also contains Vitamin C (250mg/100g in Sencha. This level is 5 times as high as a lemon). Vitamin C is good for dry skin, as well as having a whitening effect and strengthening blood vessels and cells. 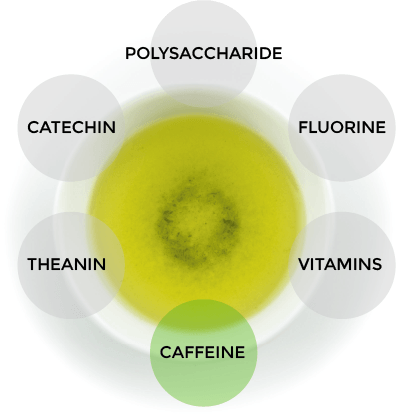 Caffeine has effects such as enhancing judgment, memorisation and recovery. Therefore having a tea break at 10:00 and 15:00 increases efficiency at the workplace. 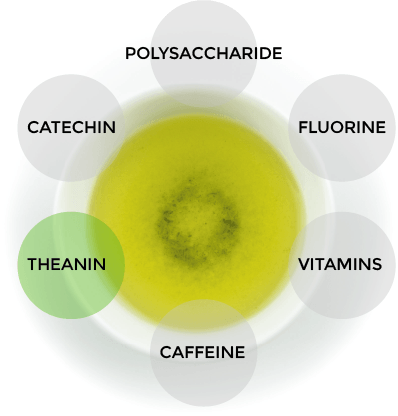 "Theanin" is a type of amino acid with an umami taste, constituting 60% of all amino acids in green tea. 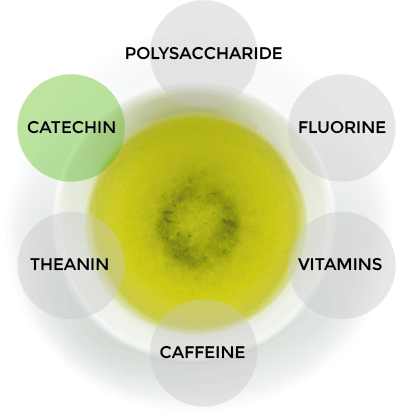 Recent studies demonstrate that drinking green tea is relaxing thanks to theanin. Theanin plays a role in lowering blood pressure. 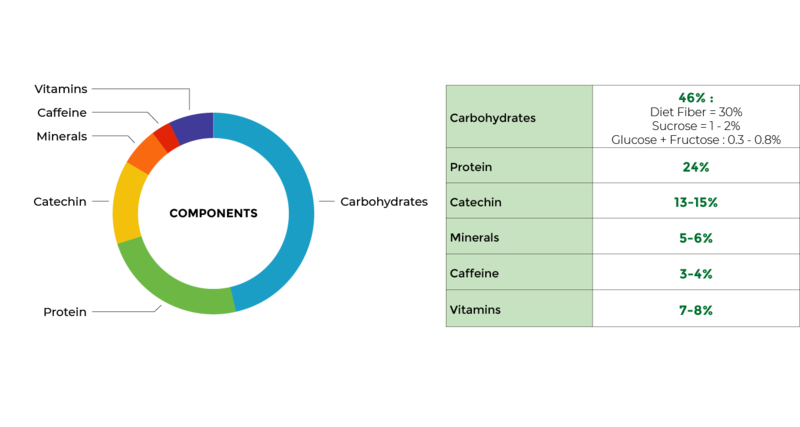 Catechin is a member of polyphenols. (It is 100 times as strong as wine and 50 times as strong as cocoa. It has the most potent antioxidant effect among natural foods). Therefore, it has an antioxidant effect, and it may be useful for precaution against aging and lifestyle diseases. Catechin has an antibacterial effect and antivirus effect. (It is applied to underwear, a mask, bed linen, other antibacterial goods and filters of air purifiers and air conditioners, etc.) Antibacterial effects against Streptococcus mutans is applied to sweets and chewing gums. It was demonstrated that catechin has the deodorant effect more than three times as strong as activated carbon which is usually used as deodorant material.